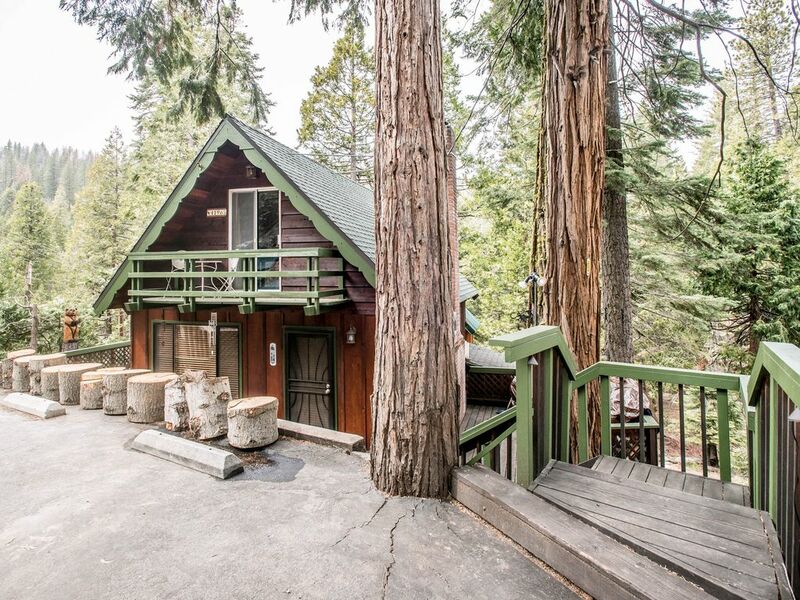 This classic 1960s Shaver Lake Village chalet has maintained its original rustic charm. It's set at the edge of the forest with a huge deck and pine views as far as the eye can see, all while being just a five-minute stroll from the quaint cafes and shops of Shaver Lake Village. The three-story layout offers a high level of privacy for family and friends enjoying this cozy cabin. The entry is where you'll find the living room with real wood fireplace insert, dining room, full bathroom with tub, UHD Smart TV with free WiFi (no satellite/cable), and a modern well-equipped kitchen. There’s also a huge deck with tables, chairs, and high-quality gas BBQ - the perfect place for everyone to gather (patio furniture and grill are not available during winter months). The upper level has a private bedroom with a queen bed and small private balcony on one side and loft/bedroom with double bed and stunning forest views on the other side. This level provides a peaceful location to enjoy a cup of coffee or an evening drink while staring out at the age-old forest. The lower level has a large bedroom with king size bed, twin bunk beds and a bathroom with shower. Equipped with a UHD smart TV, this spacious bedroom offers the perfect place for the kids to hang out and enjoy a movie or play games while the adults enjoy the fireplace and huge deck on the main level. The cabin will comfortably sleep eight; with a king, queen, full and twin bunk beds, your family and friends are sure to find an arrangement that suits your needs. We can also provide a roll-away bed on the upper level for that extra kiddo. Parking Notes: Also room for a car and boat trailer to turn around. We had an amazing experience staying at this home. We loved that all the necessary cooking wear was available to us as well as how simple it was to access the home. The town is very small but so welcoming. We would love to come back to this chalet!!!! Lovely little cabin. The floors were pretty clean and the new carpet was clean & didn't smell musty. Plenty of amenities for a weekend getaway. Ample furniture & beds for our family. Arrival & check out duties were simple & straightforward. The short staircase without hand railing was slightly nerve wracking. And there wasn't enough toilet paper, paper towels and only a single loads worth of laundry detergent left. My family and I loved this place! This cabin was truly amazing and just perfect for all 8 of us. We only brought our food and clothing and we were still over packed! Everything plus more was Conveniently at our hands. The deck was beautiful and full of snow! It was like we had our own little snow park. The location was great, lake was right down the street and stores were all in walking distance. We are already planning out next snow trip and are looking forward to staying in this cabin again... We loved every bit of it! Nice cozy cabin, close to village center. I loved EVERYTHING about it. I have absolutely NOTHING negative to say, no complaints what so ever. Super comfortable, it has basically everything you need. Perfect place to stay!!! Has all the amenities you need!!! Def rent this place again!! !